"Great tasting granola sweetened with honey. A very versatile recipe as your favorite nuts and dried fruit can easily be substituted for those listed." Preheat oven to 300 degrees F (150 degrees C). Line a large baking sheet with parchment paper. In a large bowl, mix the oats, almonds, wheat germ, sunflower seeds, flax seeds, cinnamon, nutmeg, canola oil, and honey. Spread evenly over the prepared baking sheet, pressing down lightly with the back of a spoon. Bake 20 minutes in the preheated oven, or until lightly browned. Allow to cool completely. 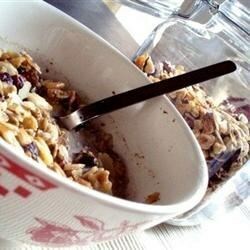 In a large bowl, break the cooled granola into large chunks. Mix in the raisins, pineapple, sweetened dried cranberries, and papaya. Store in an airtight container. Excellent recipe! I took the advice of another reviewer and boiled the honey first to make it spread further. Thanks for a great recipe Chris!